For Christmas, I received a cupcake set from one of my friends. So time to bake some cupcakes! 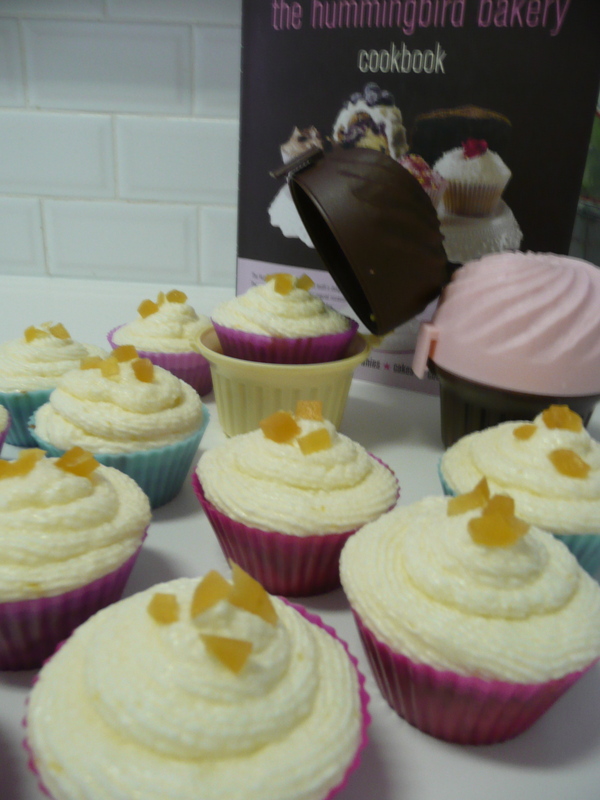 With such fantastic weather, we needed a winter warmer and these cupcakes did just the trick. I found the recipe in my trusted The Hummingbird Bakery Cookbook. If you’re not a big fan of icing (like me) you can leave out the icing altogether, the cupcakes are delicious without it as well. If, like my boyfriend, you think the icing is the best part then you can go all the way! First, for the ginger frosting, put 100 ml milk and 1 large piece of fresh ginger (peeled and chopped into 4 chunks) in a jug, cover and refrigerate for a few hours, or overnight if possible. Preheat the oven to 160 C and line a 12-hole cupcake tray with paper cases. Put 120 g plain flour, 140 g caster sugar, 1 and 1/2 tsp baking powder, 1/2 tsp ground cinnamon, 1/4 tsp ground allspice, a pinch of salt and 40 g softened butter in a bowl and beat on a slow speed until you get a sandy consistency and everything is combined. Add half of 120 ml milk and beat again until just incorporated. Whisk the rest of the milk with 1 egg and 1/4 tsp vanilla extract for a few seconds, then pour into the flour mixture and continue beating until just incorporated. Continue mixing for a couple more minutes until the mixture is smooth. Stir in 200 g chopped stem ginger in syrup (reserve 100 ml of the syrup) by hand until evenly dispersed. Spoon the mixture into the paper cases until two-thirds full and bake in the preheated oven for 20-25 min until golden brown. While the cupcakes are baking, pour the reserved ginger syrup and 100 ml water into a small saucepan and bring to the boil. Boil until reduced by one-third. When the hot cupcakes come out of the oven, pour a tablespoon of syrup over each one. 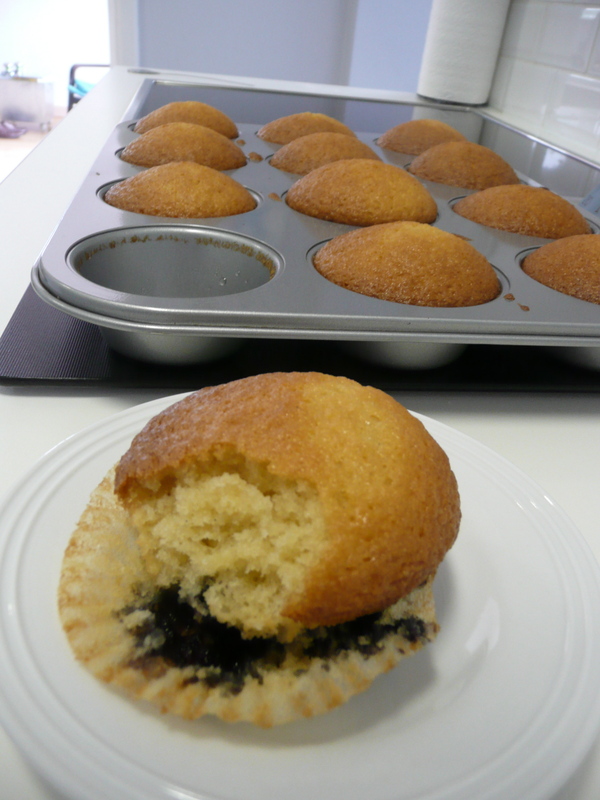 Leave the cupcakes to cool slightly in the tray before transferring to a wire-rack to cool completely. For the ginger frosting, beat together 400 g icing sugar, 125 g softened butter and the zest of 1/2 lemon on medium-slow speed until the mixture comes together and is well mixed. Turn the mixer down to low speed and slowly pour the ginger-infused milk into the butter mixture (discarding the chunks of ginger). Once all the milk has been incorporated, turn the mixer to high speed and continue beating for at least 5 min until the frosting is light and fluffy. When the cupcakes are cold, spoon the ginger frosting on top and finish with some more chopped stem ginger and lemon zest if you like. Enjoy! Tip: if you can’t find stem ginger in syrup (in Belgium, try the English supermarket Stone Manor if you need some, they are the only ones that stock it as far as I know), use candied ginger instead. To make the syrup, use 100 ml water, 50 g sugar and a grated thumb-size piece of ginger instead, straining it before pouring on the cupcakes. Or you can just leave out the syrup altogether, your cakes will still be delicious! I’m a huge fan of blueberry muffins. In Belgium, they’re not easy to find (not if you want a really tasty one that is) so it’s always the first thing I buy when I get to London (and the second, and third…). My Hummingbird Bakery Cookbook contains a blueberry muffin recipe, and as I haven’t got a trip to London planned in the near future, I decided it was time to give the recipe a go. The result was delicious, but it wasn’t a muffin, more a cute little cake as you can see in the picture. Although that’s probably due to the fact that I used a cupcake tin instead of a muffin tin… another item to add on my wish list! Preheat the oven to 170 C and line a 12-hole muffin tray (american size, which is bigger then UK size) with paper cases. Put 360 g plain flour, 370 g caster sugar, 1 tsp salt, 1 and 1/2 tsp baking powder and 1/2 tsp bicarbonate of soda in a bowl and mix on slow speed (the recipe suggest using an electric mixer but I did it by hand to avoid the cloud of dust – and also because I was lazy: my whisks where in the dishwasher and I didn’t feel like washing them by hand. In the end I thought my arm would fall off at any time, so maybe the electric option as the recipe suggest is not so bad after all). Put 375 ml buttermilk, 1 egg and 1/2 tsp vanilla extract in a jug and mix to combine. Slowly pour into the flour mixture and beat until all the ingredients are incorporated. Pour in 70 g melted butter and beat until it has just been incorporated, then turn the mixer up to medium speed and beat until the dough is even and smooth. Finally, gently fold in 250 g blueberries with a wooden spoon until evenly dispersed. Spoon the mixture into the paper cases until two-thirds full and bake in the preheated oven for 20-25 min, or until golden brown and the sponge bounces back when touched. Leave to cool slightly in the tray before turning out onto a wire rack to cool completely. You can store them in a box to keep all week, but don’t put the box in the sun as I did, that makes them get really really sticky (but still good!). Enjoy!